Dale Reynolds & Dennis Nunez were the Fly Fishers of Idaho raffle winners at the Idaho Sportsman Show held on March 4 – 7. We want to thank everyone that purchased a raffle ticket and/or stopped by the booth during the show. Dennis and his father stopped by the booth and joined FFI during the show. At the same time they purchased a couple of raffle tickets. 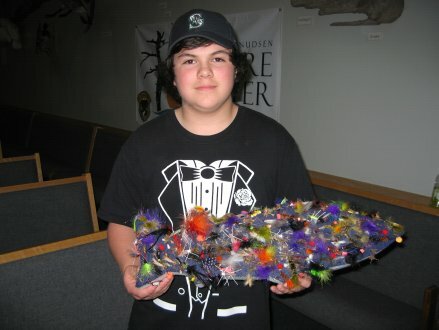 Dennis won the “Big Fish” that is adorned with flies tied by or purchased by members of FFI. We would love to tell you how many flies were actually on the “Big Fish”, but we couldn’t get anyone to actually sit down and count them all. All we can say is that Dennis should have enough flies to get him through the next year or two and in about any kind of fishing situation. 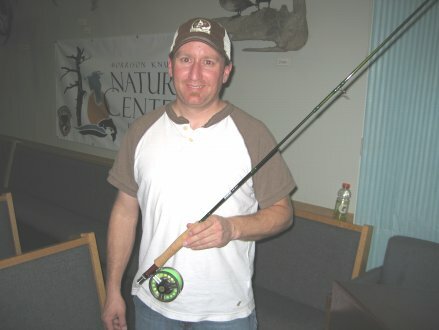 Dale Reynolds won the Sage Z-Axis four piece, five weight rod with a Greys reel and additional spools. Dale and his family decided to join FFI when they came to pick up their prize during the March FFI meeting. Congratulations to the winners and we look forward to seeing you all at the Sportman Show next year. This entry was posted on March 23, 2010 at 12:07 pm and is filed under Special Events. You can follow any responses to this entry through the RSS 2.0 feed. Both comments and pings are currently closed.